Ceviche belongs in the summertime. The Latin American dish, made by “cooking" raw seafood in a citrus-juice marinade, is just as refreshing as slowly pouring a cold beer over your head on a hot day. Fittingly, it’s often paired with sips of one. "The most common drink [to pair with] is a Mexican beer,” said Mely Martinez, the Washington, DC–based food blogger behind Mexico in My Kitchen. Her homestyle Mexican recipes, which have won praise from the likes of NBC Latino, are often inspired by the seasons. In the winter, she favors hearty soups and stews; in the summer’s glow, her thoughts turn to fresh, flavorful seafood. Born in Tampico, a port city in the Mexican state of Tamaulipas, Martinez became familiar with ceviche—and where it comes from—at an early age. “The most common ceviche in my hometown is the one prepared with a fish called ‘lisa,’” a term for mullet, she said. "People will often gather at the marketplace where all the fishing boats arrive early in the morning to buy the fish there, where it is sold already chopped into cubes for ceviche." She later became a teacher and moved around Mexico for her career. As she traveled, she noticed differences in the recipes of each region. “There is a great variety of ceviche, such as the ceviche blanco in the state of Veracruz that uses chipotle peppers, [and] the famous aguachiles cocktail in the state of Sinaloa made with shrimp and ground chilies verdes,” she said. Living on the Yucatán Peninsula, she witnessed firsthand the variety that three-sided ocean exposure brought to the dish: "Besides shrimp, fish, and octopus ceviches, you can also find ceviche made out of blue marlin and calamari." Martinez traveled extensively to gain her in-depth knowledge of ceviche, but Chicagoans needn’t go far to taste the recipes she describes. That’s because the city’s large Hispanic populations make it easy to find many varieties of the quintessential dish. Mexican eateries specialize in regional preparations, and Peruvian, Ecuadorian, and Spanish restaurants craft their own versions of the citrusy seafood, serving it with crackers or plantain chips for dipping. There’s also a new generation of chefs who prepare creative riffs on the classic. "There are some versions of ceviche that use tequila, vinegar, or a mixture of lime juice and orange juice [to marinate the fish]," Martinez said. "I have even seen some recipes that use orange soda." Based on Martinez's descriptions, we’ve put together a ceviche guide for Chicagoans: For a Sinaloan-style ceviche, try Frontera Grill at 445 N. Clark St. At this Rick Bayless restaurant, called “outstanding” by the James Beard Foundation, chefs craft ceviche with blue shrimp imported from the Sinaloan city of Mazatlán. They flavor the seafood with serrano chilies, lime juice, crunchy jicama, cucumber, red onions, and micro cilantro. For a taste of the Yucatán, try Mariscos El Veneno at 1024 N. Ashland Ave. Sample a simple marlin ceviche or a mixed cocktail of marlin, octopus, shrimp, clams, and oysters at this East Village eatery. It’s BYOB, so bring along your favorite Mexican beer or, alternatively, a barrel of mead and a group of friends dressed in medieval garb. 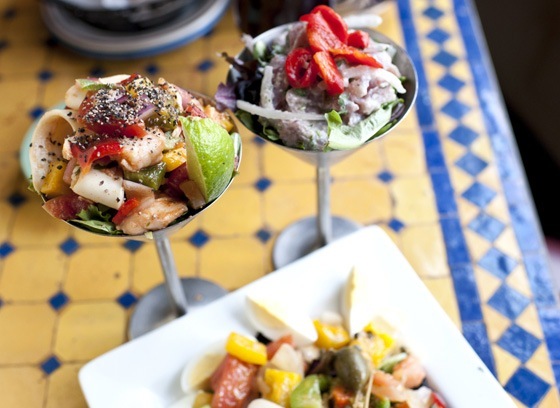 For a creative ceviche, try Mercadito at 108 W. Kinzie St. Here, chefs venture into new flavor territories with specialties such as bay-scallop ceviche in lime-habanero broth with mint, red grapes, and pumpkin seeds. Halley is a Chicago writer with southern roots. When she isn't typing, she enjoys cooking without recipes and designing garments for her upcoming clothing line, Ambidestre.